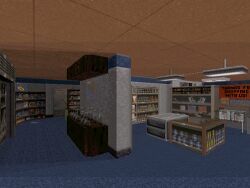 Description: A sequel to Red3 which scored highest rank here a year ago. Duke is on a cruise which is heading towards a waterfall. Tons of new ideas, scripted sequences, complex design and excellent puzzles. Design: Design is very complex and detailed. Everywhere you go you'll see most complex eyecandy and sprite filled rooms. Boat is moving all the time so you'll see how landscape moves (same effect as in that train level in The Final Confrontation). Level really looks like a cruise ship with basement/engine floor, cabin floor, restaurant floor, some outside sectors, a store etc. Unreachable outdoor sceneries look very good. Flooded sections were exciting & looked good. Textures: Texture usage is very complex, unique and original. Hallways for example are full of different textures which are mixed extremely well with sprites, paintings and different palette values. Theme is old and dark - like a scary movie. 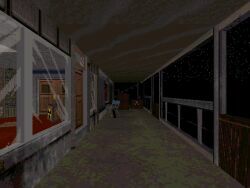 Dead hallways, covered with bodies, screams and realistic textures really gives the feeling that you're there. Gameplay: Just excellent. It's almost like Half-Life. Because of all those ambient sounds, scripted sequences etc. it really feels like the world around you is alive. Story is followed through viewsceens and scripted sequences. Number of monsters is excellent and they're well place around the level. Sometimes there's a roar sound before you encounter the enemy itself which gives a nice touch to gameplay. Puzzles are genius, fun and different. Bot file has been included but Red4 doesn't work very well with bots due to it's complex design. Innovations: This map is a new innovation. There are scripted sequences which you will love. These action scenes follows the storyline. Ambient sounds are extremely well used, there are new texture/design ideas etc. Oh and you'll love the ending. Conclusion: No I won't give it 100. Red4 is better than Red3 but not much. Red4 is full of new ideas, neat design and everything so 99 is what it deserves. I won't give it a hundred points because nothing is perfect.